All airports are ephemeral. Paved runways are continuously savaged by weather, baked by the sun, and fractured by infiltrating vegetation. Without regular maintenance, they eventually crumble to dust. However, the airport in Alton Bay, New Hampshire (B18) carries this notion of transience to an extreme. Each winter, when ice on the bay exceeds 12" thick, a team of volunteers organized by Paul LaRochelle creates a temporary, FAA-sanctioned airport on the ice. The airport's existence is often a day-by-day affair, directed by the whimsy of warm fronts, precipitation in its various forms, and rogue snowmobiles. By FAA mandate, the airport must officially close by March 15 regardless of its physical condition. As a result, Alton Bay is a unique experience for those of us who do not fly ski- or bushwheel-equipped airplanes and it is a bucket list item for many pilots. The challenge of aligning windows of opportunity between Rochester weather, conditions across Vermont's Green Mountains, and availability of an ice runway in New Hampshire means that I have only managed one other trip to B18 in the past decade. That was a wonderful day, an opportunistic trip taken on a quiet weekday in 2015. This year, Alton Bay has struggled. Snowmobile tracks made across the runway under slushy conditions hardened into a rough surface. Warm spells and rain showers have resulted in thaws and standing water on the runway. Snowstorms necessitate eight hours of plowing to re-open the airport. The ice runway was officially closed on Friday, February 16 owing to standing water from rain. 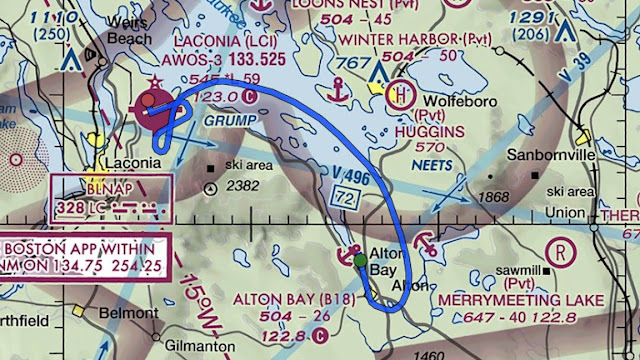 After a cold night, however, the Alton Bay Seaplane Base and Ice Runway Facebook page announced that the ice was open again to landing as of 6:52 am on Saturday, February 17. I had sent a note to several friends on Friday looking for interest in flying to Alton Bay on Saturday. Interest was high, but because Ed responded within two minutes of my clicking the [Send] button in Gmail, he scooped all the others and got the right seat. Outbound under a clear blue sky, a tailwind pushed us up to 141 knots over the ground through perfectly smooth air. Low level turbulence forecast for New Hampshire did not come to pass, though the mountain obscuration warnings between Syracuse and Glens Falls were spot on. Closer to Alton Bay, I diverted over Lake Winnipesaukee near Laconia with the intention of following the amorphous shoreline into Alton Bay from the north. Aircraft were landing on runway 01 at Alton Bay such that a northern approach would place us directly into the downwind leg of the pattern. The air was crystal clear and, in the distance, the snow-capped peak of Mount Washington was obvious as the highest terrain feature in the region. 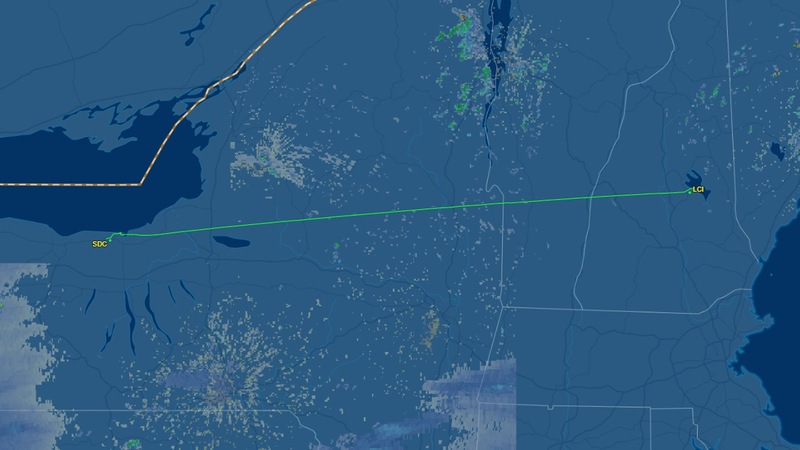 With tailwinds, flight time from Sodus to Alton Bay was two hours and five minutes. On approach to Alton Bay, ADS-B traffic was useful in sorting out the various aircraft converging for landing on the ice. However, the high terrain in the region caused the unequipped aircraft to disappear when their Mode C outputs were no longer received by local radar installations. Unlike my previous visit, Paul et al. had managed to clear the parallel taxiway for use. This was helpful in reducing spacing in the pattern because there was no waiting for back-taxiing aircraft to clear the runway. Most aircraft simply rolled to the end of the 3,000 foot runway before exiting. I made a power off approach with full flaps at 57 KIAS, which is a useful short field approach speed in calm conditions for the Warrior. We touched down softly at minimum speed, using much less of the slick runway than on my last visit. Paul directed us to parking and Bob helped us reposition the airplane into the line of parked aircraft. Wearing ice cleats, Bob simply grabbed the Warrior and literally dragged her into position on the slick surface. Later that morning, I watched him move another aircraft while essentially dragging its pilot along as the fellow clung impotently to a tow bar. We photographically documented Ed's first visit to New Hampshire's famous transitory runway. Ed snagged a photo of me trying not to fall on the ice. I did bring my YakTrax, but did not use them. We had the good fortune to meet Paul in person. Paul worked the airport Unicom and directed pilots to parking all morning. He expressed concern about the snow coming that evening and warm days expected for the following week, speculating that we might have arrived on the last operational day for the ice runway in 2018. Indeed, the ice was closed the next day with 7" of snow on the surface. Weird. That same airplane was at Alton Bay the last time I was there. There was a steady stream of arrivals to the ice all morning. Fortunately, parking was ample and Bob and Paul had things well under control. Ed and I visited with Donna in Facet Jewelers and signed the airport register. I left a donation and bought a new B18 hat. From there, we had a decent late morning breakfast at the Olde Bay Diner. After "breakfast", we simply stood on shore and watched the activity of aircraft coming and going. There was a sweet little 1946 Ercoupe parked on the ice, but wow, are those things ever tiny. Still, it was nicely equipped and beautifully maintained. As expected, there were lots of Cessna and Cherokee trikes, but arrivals also included the aforementioned Ercoupe, a Citabria, a couple of Stinsons, a Piper Lance/Saratoga, a homebuilt, and a Bonanza. This 1948 Stinson 108 visiting from Rhode Island really caught my eye. It was gorgeous. Bob helps reposition a homebuilt after landing. The pilot of this Cherokee 6 had a rough day. He or she approached high and fast, forced the unwilling airplane down on the ice, and caused it to porpoise on its oleo struts. The pilot aborted the landing, went around, and repeated this performance at least three more times. As I watched the supersized Cherokee slam itself onto the ice on a fourth attempt, I could not help but think, please don't break the runway! In reviewing the photographs later, I counted at least thirty unique aircraft (including mine) at Alton Bay during the two hours Ed and I were there. It was a busy day on the ice and the activity drew a lot of interested bystanders. On my previous visit to Alton Bay, the ice had a milky appearance. This time around, the ice was relatively clear, if full of tiny air bubbles. I trust Paul's efforts in ensuring that the ice is safe, but peering through the surface on which my airplane was parked nonetheless made me feel a bit queasy. By late morning, a tailwind had developed for arrivals on runway 01 and this probably contributed to the Cherokee 6 pilot's woes. Despite a pattern full of airplanes, Paul wisely switched the landing direction to runway 19 as Ed and I prepared to depart. We taxied to runway 19 for departure behind the Ercoupe. By my count, this Cessna was the thirtieth airplane we saw at Alton Bay that morning, rolling out for landing on Runway 19 after Paul changed the landing direction. The ice was much busier than when I visited previously, adding an entirely new dimension to the experience. On departure, we climbed well above pattern altitude and followed the Ercoupe to Laconia for fuel. Unlike the bright world we traversed in the morning, our flight home was made beneath a gray overcast. We pushed against a headwind that slowed our groundspeed into the 90 knot range as the pressure dropped rapidly (from 30.36 inches Hg near Boston to 30.08 inches at Sodus). Closer to Sodus, we had a near encounter with Eight Five X-Ray (again?) and dodged a Mooney that tried to drive right through us on its way in to the pattern. Thank goodness for the early warning provided by ADS-B traffic. I did three 360° turns over the Lake Ontario shore before proceeding inbound. I think the day can be best summed-up by the text messages I exchanged with Darrell during breakfast. Darrell was explaining that he and his son were visiting Embry Riddle in Florida for the day and that the place was "awesome". "Cool!" I responded. "But not as cool as an ice runway!"